Postpartum exercise: Is your body ready? How soon after delivery can I start exercising? The American College of Obstetricians and Gynecologists says it’s okay to gradually resume exercising as soon as you feel up to it. But your doctor or midwife may want you to wait until your six-week postpartum checkup to see how you’re doing first. Generally, if you exercised throughout your pregnancy and had a normal vaginal delivery, you can safely do light exercise—walking, modified push-ups, and stretching—within days of giving birth. Start slowly with a low-impact aerobic activity such as walking. As you regain strength, you can increase the length or number of walks. If you had a c-section, check with your doctor first and expect to wait until you recover from your operation before beginning an exercise program. An incision from a c-section takes at least several weeks to heal, and it may be some time after that before you feel like working out. However, walking at an easy pace is encouraged because it promotes healing and helps prevent blood clots and other complications. If you weren’t active during your pregnancy, or tapered off your fitness routine as the weeks went on, check with your doctor or midwife before you begin exercising. In any case, remember that your joints and ligaments will still be loose for about three to five months, so watch your step to avoid falling. If you want to take an exercise class, try to find one taught by a postpartum exercise specialist. Many YMCAs, recreation centers, gyms, and yoga studios offer exercise classes for new moms. Or you could always go for a low-impact class that focuses on toning and stretching. Exercise is good for you, but don’t overdo it for the first few months after giving birth. Your body needs time to heal, and you need time to adjust to your new role—and bond with your baby. Do I need to be careful of my abdominal muscles? Some women develop a gap in their abdominal muscles as their belly expands during pregnancy and labor, a condition called diastasis recti. It takes four to eight weeks after giving birth for this gap to close. Lie flat on your back with your knees bent. Place the fingers of your left hand, palm facing you, just above your belly button. Place your right hand on your upper thigh. Inhale, then exhale. As you exhale, lift your head and shoulders off the floor and slide your right hand up your thigh toward your knee. This will make your abdominal muscles tighten, and you should be able to feel the gap where the muscles have separated. If you feel a gap, ask your doctor to do a physical exam. If your doctor says it’s safe, you can gently begin to strengthen your abdominal muscles with pelvic tilts, leg slides, and crunches, or sit-ups. Once the gap narrows to only one or two finger widths, you can start doing crunches or sit-ups. Will exercise affect my ability to breastfeed? No, it won’t. As long as you drink plenty of extra water, even vigorous exercise won’t significantly affect the amount or composition of your breast milk. But you’ll want to avoid exercises that make your breasts sore or tender. Wear a supportive sports bra while working out, and try to nurse your baby before you exercise so your breasts won’t feel uncomfortably full. Are there any physical signs that I might be trying to do too much too soon? Too much physical activity during the first few weeks after delivery can cause your vaginal discharge, called lochia, to become redder and to flow more heavily. This is one signal to slow down. Call your doctor or midwife if vaginal bleeding restarts after you thought it had stopped or if you experience any pain when you exercise. And if exercise makes you feel exhausted instead of invigorated, that’s also a sign that you probably need to take it a little easier. What’s the best way to lose weight after giving birth? The best way to start dropping those pregnancy pounds is to do some form of aerobic exercise to get your heart rate up. Try walking briskly, running, swimming, or biking. But wait at least six week and preferably a few months before actively trying to slim down. Don’t aim to lose more than a pound per week, especially if you’re breastfeeding. Starting a diet too soon after giving birth can affect your mood and energy level as well as your milk supply. If you’re patient and give your body time to do its work, you may be surprised at how much weight you lose naturally. Almost every day, there’s a new study that comes out with sensational headlines that “proves” a certain way of training is better for fat loss than another. For example, a Duke study was published a couple of weeks ago that researched whether cardio vs weight training is better for weight loss. With a reputable university behind the study and the media fervently promoting it, you are led to believe that if you want to lose fat optimally, you should only do cardio training. This article explores several reasons why this conclusion may not be as sound as the authors claim it to be…to put it lightly. 1) Is Cardio Really “Optimal” For Fat Loss? – If someone said they are going to the gym 3 days per week for 8 months in order to lose weight and fat, but only lost 3.6 pounds of fat, would you say that was a good workout routine? Well, the people in this research study did just that. When the researchers claimed that the “optimal mode of exercise for reducing fat mass” they claimed that the aerobic training group who lost only 3.6 pounds of fat in 8 months was the best way to do this. As anyone who has taken on a fat loss program knows, an average of less than half a pound of fat lost per month equals really poor results. 2) Questionable Diet Protocol – In this particular study, these “weight loss” participants were told to adhere to a 2100 calorie diet, yet were overweight or obese to begin with. A diet of 2100 calories for someone who’s overweight or obese, would be a low calorie diet that, in and of itself, would cause weight loss. In this study, the researchers used a 3-day food diary and a 24-hour recall, two methods that have been shown to be poor predictors of actual calorie consumption, especially when dealing with an 8-month weight loss program. 3) Cardio Group Did Not Burn The Most Fat – The researchers claimed that the aerobic training group was the group that lost the most fat, but in actuality it was the combination group who lost 5.4 pounds of fat (they also gained some muscle). This is still not a huge amount of fat loss over 8 months, but is better than the aerobic only training group. 4) Weight Training Exercise Selection Not Very Effective – Researchers only stated that the resistance training group used 8 machines that worked the entire body. In college, I worked at a commercial gym, where they put a “circuit line” of 8 strength machines, 4 of which included single-joint movements. For example, this line included a preacher curl machine, which only works the biceps and a tricep extension machine that only worked your triceps. The other 2 isolation exercises were a leg extension and seated hamstring curl machine. These machines have their utility, but for the most part, should be used sparingly and really only for those with body building pursuits. If on the other hand, you’re trying to lose weight, you want to do as many multi-joint, free-weight movements as possible. The multi-joint exercises will induce more intensity and cause you to work more muscles, therefore increasing muscle burn. 5) Weight Training Routine Not Very Effective – In addition to that, these circuits took anywhere from 10-12 minutes to complete the 8 machines. Three rounds of these 8 machines would take a total of 30-35 minutes. In this study, three rounds of 8 machine-based exercises took an hour, about 15-20 minutes longer than it took the aerobic group in the study. It was also 25-30 minutes longer than it took people to complete the circuit I was supervising nearly 10 years ago. This leads to 5 major weaknesses with this study. Overall, the aerobic group lost less than a half of pound of fat per month (not week). Food intake was not really controlled, which plays a very important factor when trying to lose fat. The intensity of the resistance training group was probably a lot less than it should be when doing a comparison of the cardio vs. weight training workouts. Lastly, the cardio training group didn’t see the best results; the training group that included both strength and cardio did. Overall, the study still had strengths that would be used in an applicable real-world setting. It focused on non-active middle-aged overweight adults with basic workouts. Overall, this study was very indicative of what the “average gym-goer” does all too often. For example, many people who are not active simply hop on a treadmill for about 30-40 minutes while doing some machines afterwards. This is something I’ve seen all too often and these are the menial results they can expect to get for their efforts (less than 4 pounds in 8 months). Cardio vs Weight Training: Why Not Both? Those in the aerobic group were able to maintain most of their muscle mass and lost fat, but what the study didn’t highlight are other benefits of resistance training or the combination of both, better known as concurrent training. Other studies, with a more intense exercise protocol, have shown that weight training before cardio training enhances fat burning during the session2, and that overall resting energy expenditure is increased following weight training.3 These studies indicate that fat-burning is indeed elevated when it comes to resistance training, especially when the workouts are intense enough. Also, recent research is indicating that concurrent training (both aerobic and resistance training), might be the best mode of exercise for fat loss.4 The largest issue with concurrent training is that it has the potential to lead to over-training, but this can be avoided by cycling more intense workouts with cycles of easier workouts. Overall, this was a study of what the average gym-goer would expect to see if they went in without any real direction or a smart program to help them in their fat loss efforts. Whether those workouts included doing only machines, hopping on a treadmill or a combination of both, the results you will expect to see would not be very significant. On the other hand, if you’re willing to work out with more intensity, use more multi-joint movements, follow and be consistent with a smarter eating plan, you can expect to see much better results. This is especially true if you use a combination of both smart resistance training with some form of interval training. Love Yourself as You Are Right Now! Don’t rush into any kind of relationship. Work on yourself. Feel yourself, experience yourself and love yourself. Do this first and you will soon attract that special loving other.” – Russ von Hoelscher When you love yourself, you give yourself what deserve. You spend your time on things you enjoy. You find out what you’re good at. You find out what you want. When you love yourself, you attract people who share your values, appreciate your strengths, and complement your abilities. You attract people whose authentic selves work with your authentic self. We are each gifted in a unique and important way. It is our privilege and our adventure to discover our own special light.” -Mary Dunbar Everyone has their own set of gifts to offer the world. To love yourself is to find and appreciate the unique talents you possess. Then, when you capitalize on those talents, you’ll earn appreciation from others, self-confidence, and a purpose-driven life. You’re always with yourself, so you might as well enjoy the company.” -Diane Von Furstenberg Loneliness is a symptom of low self-esteem. If you have a positive relationship with yourself, loneliness doesn’t happen. When we’re lonely, we think we want to be around others when, really, we just want to be away from ourselves. Think of a time when your inner voice was your worst critic. Imagine meeting a person who talked to you that way. Would you want to be around them? Of course, not! This is exactly why we crave company when we’re in the presence of critical selves – because we want to escape. Self-love means you’ll never want to escape yourself again, so you’ll never be lonely. Your chances of success in any undertaking can always be measured by your belief in yourself.” -Robert Collier To love yourself is to believe in yourself. Believing in yourself gives you determination which is stronger and more powerful than any obstacle. You will also have nothing to lose by taking risks because you’ll always have a solid foundation of self-love to fall back on if your endeavor does not work out. Self-love is key in risk taking. Risk taking is key in creativity. Creativity is key in success. If you aren’t good at loving yourself, you will have a difficult time loving anyone, since you’ll resent the time and energy you give another person that you aren’t even giving to yourself.” -Barbara De Angelis It may be a cliché, but you really must love yourself first before you love anyone else. What you give to others is a reflection of what you give to yourself. If you do not give yourself love and appreciation, you will not give them to anyone else. You will give others jealousy or criticism. When you become more loving to your authentic self, you also become more kind, loving, and generous to others. It ain’t what they call you, it’s what you answer to.” -W.C. Fields What others give you is, also, a reflection of what they give themselves. Simply because of their own self-loathing, people will sometimes say or do things that have the potential to harm or manipulate you. Self-love gives you the ability to detect this potential and the self-respect to walk away. Resolve to be thyself: and know, that he who finds himself, loses his misery.” -Matthew Arnold If you don’t love yourself, no amount of pleasures or accomplishments will save you from constantly returning to that dark place of self-pity and self-destruction. That place is toxic. The day you resolve to love yourself is the day you begin to clean the toxic effects of self-loathing out of your body so that, someday, you never have to go back to that place again. You are as amazing as you let yourself be. Let me repeat that. You are as amazing as you let yourself be.” -Elizabeth Alraune We all make mistakes. We all reach roadblocks. We all have fears. Powered by self-love, we learn from our mistakes, go around our roadblocks, and face our fears. Loving yourself gives you self-efficacy in the face of all life’s challenges. That way, you will always keep growing and learning instead of stalling and stewing. For once, you believed in yourself. You believed you were beautiful and so did the rest of the world.” -Sarah Dessen It has been said that beauty lies in the eye of the beholder. The most frequent beholder of your beauty is you. The more you love yourself, the more beautiful you feel. Then, you develop self-confidence, which, in turn, makes you more beautiful to others. When you find beauty in yourself, you expose that beauty to the world and, thus, give others the chance to see and admire it. “Women are their own worst beauty critics. Scarcity of self value cannot be remedied by money, recognition, affection, attention or influence.” -Gary Zukav Many people seek happiness outside of themselves. They get the car, the money, the job and, perhaps, feel happy for a moment before those feelings drain and they’re left wanting more. This is not really “happiness”. True happiness lasts. True happiness comes from within. To love yourself is to fill yourself with a powerful, positive emotion that does not constantly dry up. It gets more and more powerful the more you nurture it. When I loved myself enough, I began leaving whatever wasn’t healthy. This meant people, jobs, my own beliefs and habits – anything that kept me small. My judgment called it disloyal. Now I see it as self-loving.” -Kim McMillen When you discover and love your authentic self, you begin to attract everything that is conducive to self-love. You also become more attracted to things which enrich your authentic self and less attracted to the things which harm your authentic self. As the things that don’t benefit you naturally fall away, you are then left with is a life full of everything that compels you to love, grow, and be happy. Until you value yourself, you won’t value your time. Until you value your time, you will not do anything with it. ” -M. Scott Peck We can either spend our time fretting over things we can’t change or capitalizing on those which we can. 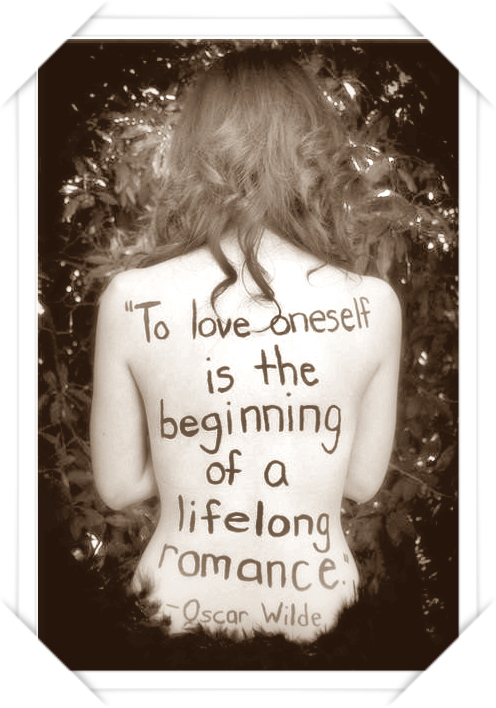 To love yourself is to accept yourself as you authentically are. Once you do that, you are better able to recognize opportunities for growth and improvement. This leads to more productivity in every aspect of your life. Thank you for reading! If you enjoyed this article, please share it! You’re just one click away from spreading self-love to others! I also welcome your comments. I would love to know which reason resonated with you most and why. Group Exercise … is it better than working out alone? 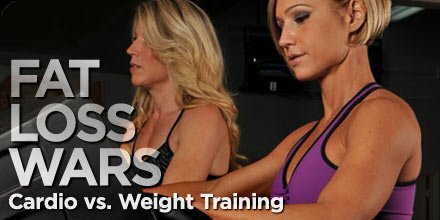 Will taking a class or finding training partners help me keep my exercise resolutions this year? Consider the similarities between a modern exercise class and an ancient religious rite – the wise leader guiding the group through a series of ritualized movements, in perfect synchronization. If you’re struggling to keep faith with your fitness goals, this apparent coincidence might offer a solution. New research suggests that group exercise unleashes a flood of chemicals in the brain, triggering the same responses that have made collective activities from dancing and laughter to religion itself such enduring aspects of human culture. For some (but not all) people, finding workout buddies could help turn fitness into a pleasant addiction. 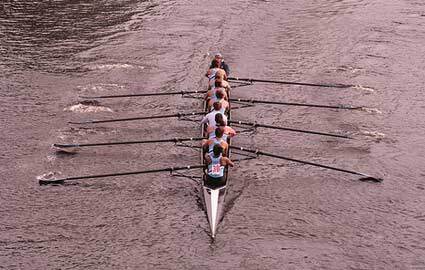 In a forthcoming issue of Biology Letters, researchers from Oxford’s Institute of Cognitive and Evolutionary Anthropology report on a study of the university’s famed rowing team. The crew was divided into teams of six, each of which performed a series of identical workouts on rowing machines. The only variable was whether the workouts were performed alone, or in teams with the six machines synchronized by the crew’s coxswain. After each workout, a blood-pressure cuff was tightened around one arm of each subject until he reported pain, an indirect method of measuring endorphin levels in the brain. Endorphins – the same chemicals that stimulate “runner’s high” – produce a mild opiate high and create a sense of well-being as well as blocking pain. Sure enough, the rowers’ pain threshold was consistently twice as high after exercising with their teammates compared to exercising alone, even though the intensity of the workouts was identical. So where does this magic come from? The endorphin surges can likely be traced back to the evolutionary benefits of group bonding, the researchers suggest. Earlier studies have suggested that synchronized physical activity elevates mood and is associated with greater altruism. But synchronization is probably not the only factor involved, notes lead author Emma Cohen, who is now at the Max Planck Institute for Evolutionary Anthropology in Germany. “We also suspect that shared goals – ultimate goals, like winning the big race, and proximate goals, like endeavouring to row together in synch – are at least part of the trigger,” she said by e-mail. She will explore this question further by studying religious drummers in Brazil this spring, while her former colleagues conduct further studies with the Oxford rowing crew. Endorphins are produced by virtually any vigorous physical activity, but group work appears to enhance the effect dramatically – and there’s plenty of evidence that exercise classes meet that description. In a series of studies stretching back more than a decade, University of Saskatchewan professor Kevin Spink has found those who feel a greater sense of “groupness” and cohesion within an exercise class are more punctual, have better attendance and even work harder. Of course, not all collections of individuals qualify as a group. Dr. Spink and other researchers have identified factors that make some crowds “groupier” than others, such as the existence of group norms. For example, the shift in the past decade from sign-up exercise classes to drop-in classes has made it more difficult to build cohesion in these groups. Still, it appears that the most important factor is what’s in your head, even for drop-in classes. “As long as I perceive the people I’m exercising with as a group, my adherence is way better,” he says. There is an important caveat regarding individual preferences. About a third of people enjoy exercising in groups, another third prefers exercising alone, while the remaining third is indifferent, Dr. Spink notes. For those who are happy exercising alone, there’s no reason to join a group. For everyone else, exercising with partners or in groups has all sorts of benefits that have nothing to do with neuroscience, from the simple act of committing to meet someone to the pleasures of gossiping during a workout. But the endorphin findings help explain how exercise is transformed from a chore to a lifelong habit, and indeed a pleasure, for some people – and suggest one way of getting there. Preheat oven to 90° C and warm a large plate for the chicken. Season the chicken breasts with salt and pepper. Heat some olive oil in a large skillet over medium-high heat. Add the chicken and cook for 3 minutes each side, or until golden brown and cooked through. Place the chicken on the warmed plate in the oven. Reduce the heat under the skillet to medium-low and cook the bacon until crisp but not burned. Set bacon aside. Add the mushrooms to the skillet and cook for about 8 minutes over medium-high heat, until any liquid from the mushrooms has completely evaporated. Return the bacon to the skillet, along with the garlic and tomato paste and cook for one minute. Add the Marsala or red wine or stock, bring to a boil and cook for about 5 minutes or until the liquid has reduced to about 1 ¼ cups. Take the skillet off the heat, add the lemon juice and whisk in the butter, one Tbsp at a time. Add the parsley and season with salt and pepper. 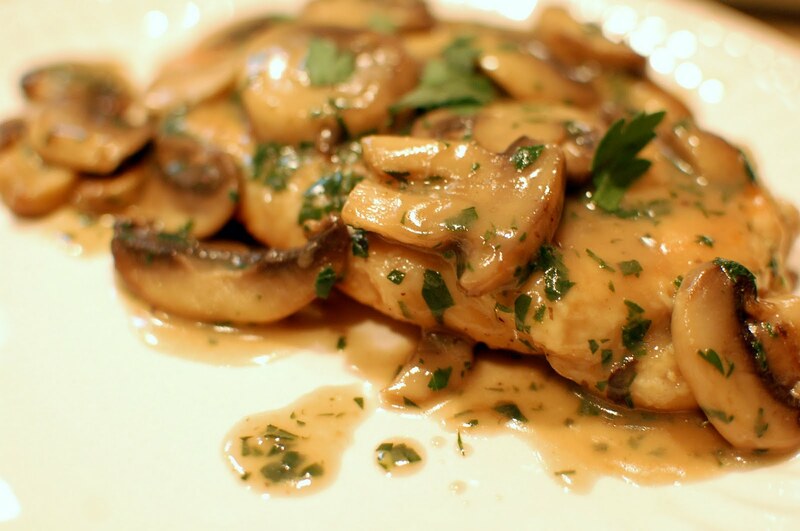 Pour the Marsala sauce over the chicken and serve with steamed greens. He was right. Pilates, a form of exercise favoured by millions of people worldwide and championed by celebrities such as Jennifer Aniston, Gwyneth Paltrow and Madonna, can give you a whole new postural structure and even increase your bone mass composition. ”Pilates is a mind-body exercise that focuses on strength, core stability, flexibility, muscle control, posture and breathing,” says Dr Jarrod Meerkin, of Exercise Sports Science Australia. This winning combination of mind and body has secured its popularity among devotees. So what happens to your body when you perform a Pilates move? ”You stabilise the core by pulling your navel back towards your spine, while simultaneously using your peripheral elements [arms and legs] in a particular movement,” Meerkin says. ”This act of stabilisation is very important for those with lower-back pain or those of the more elderly population, to improve bone density in the hips and spine. According to Osteoporosis Australia, more than 1 million Australians are affected by fragile and brittle bones, which can lead to a higher risk of fractures. ”Bones are similar to muscles,” Meerkin says. ”Just as you can improve the size of your arm muscles by doing biceps curls, you can improve the bone mass by using muscles attached to a particular site. ”Pilates movements focus on your skeletal structure and the muscles attached to your spine and hips,” says Dr Oskar Lindback, a chiropractor and director of Peak Potential Bulleen, Victoria. All poses focus on the skeletal structure and the muscles attached to the spine, in particular the deeper ones that lie under the surface muscles, so as you become stronger, your skeletal structure becomes healthier. ”Weak abdominal muscles can lead to back pain,” Lindback says. Stretching and strengthening your body doesn’t involve only poses on a mat. There are now Pilates reformers, accessories such as ”magic circles” and vibration machines. hip-to-waist measurements and flexibility had improved. ”This is probably because they were sedentary, so any exercise can make a difference,” Meerkin says. ”No amount of Pilates will help give you a six-pack or reduce the amount around your belly. ”It’s not an effective mechanism to lose weight on it’s own but great as an accompaniment – just one class a week can help improve your posture and bone mass,” Meerkin says. Looking for the right running shoes? These days, the search can be daunting. It used to be so simple. As kids, we had sneakers that we wore for everything from riding a bike to climbing a tree to playing baseball in the backyard. Now there are shoes for every sport — and countless varieties to choose from. Asics, Nike, Mizuno, New Balance, Saucony — these are just a few of the companies that sell running shoes. It’s hard to pronounce these brands, let alone remember them. So how do you know which running shoes are right for you? The best first step in finding the right running shoes is knowing what you will be doing with them, says Bruce Wilk, physical therapist and owner of The Runner’s High, a running specialty store in Miami. Are you a jogger or a runner? Do you run 15 miles a week or 25? Do you run on trails, asphalt, or a treadmill? Are you training for a race? “A high school track runner is different than a middle-aged marathoner,” says Wilk. You also have to take into account your body type, he says. “A big round person is different than a narrow skinny person,” says Wilk, and there are running shoes out there for every body type. Know how you run, says Wilk. It’s important to determine where a person first comes in contact with the ground. Is it the outside of the heel? Is it at the inside of the forefoot? If you’re a forefoot runner, you should be wearing a running shoe like the Nike Vomero, which has most of its cushion in front. If you run from heel to toe, the Asics Gel Kayano might be the right running shoe for you. Be sure to identify any injuries you have developed from running, as well. Problems like shin splints, blisters, tendonitis, and plantar fasciitis often can be reversed with the proper fitting running shoes. The shape of your arch helps determine whether you pronate (roll to the inside of the foot), supinate (roll to the outside of the foot) or remain pretty neutral when you run. Supinators (sometimes called underpronators) are rare, says Wilk. Many more people overpronate, which can lead to lots of overuse injuries. Many stores that sell running shoes will give you a “wet test,” that is, they moisten the bottom of your foot and have you make an imprint on a sidewalk or dark piece of paper to determine the size of your arch. When you are being fitted for running shoes, it’s not only important that there is enough space in the toe box when you stand, your whole foot should fit on the platform of the shoe, Wilk says. “I teach my staff to palpate 360 degrees around the foot to make sure that all the bones are sitting on the shoe platform,” he says. “The shoe fitting is not just that the upper is wide and long enough.” says Wilk. 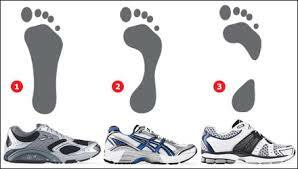 The running shoe shouldn’t squeeze the foot, and the entire width of the foot should be touching the base of the shoe. Feet swell during the day, says Julie Isphording, a former Olympic runner and organizer of Cincinnati’s historic Thanksgiving Day Race. They also swell during a run, so trying on running shoes when your feet are at their largest is going to give you the most comfortable fit. When you are shopping for a new pair of running shoes, bring your old ones along, Isphording says. No, you don’t get to have them resoled or trade them in, but you can help the salesperson determine what kind of running shoes you need by having him look at the pair you’ve been wearing. The salesperson will look at the way your old shoe is worn to confirm your running patterns. Determining your shoe size is essential for a comfortable fit. Keep in mind, too, that the size you wear in a Saucony shoe may not be the size you wear in an Adidas shoe. Not only the size, but the shape of our feet change over time, she adds. If your foot flattens, for example, you may need to change the type of shoe you buy from one designed for stability to one with motion control. Be careful about buying a shoe for looks, warns Wilk. “The average time a consumer takes to pick out a pair of running shoes is about 10 to 15 seconds,” says Wilk. Knowing that, he says shoe manufacturers will use characteristics like looks, weight (lightness) and cushion to sell shoes because these are tactile factors that appeal to consumers. “Fashion running sneakers,” he says, “are hourglass-shaped because that shape makes the foot look smaller,” Wilk explains. “No foot is hourglass-shaped. It’s either C-shaped or straight. Even if you find out you are a pronator with flat feet and weak ankles, you may not necessarily want to buy the stiffest, bulkiest — what people in the industry call the “motion control” — shoe, suggests Pittsley. Once a salesperson can narrow down the type of runner you are and the type of foot you have, he or she will likely have several options for you. Try them all, says Isphording. Don’t rush. Take your time trying on and testing shoes. Most good specialty running stores will have a treadmill in the store where you can try out your shoes. If there’s no treadmill, ask to run somewhere close by. Trying on a shoe is much different than running in it. After all, you don’t just sit in a car and decide you want to buy it, you start the engine and take it around the block. This is a key step in the process, he says. Wilk asks customers to run at pace and then asks these questions: How does the shoe feel on initial contact? How does it transition? Is there anything that’s rubbing you wrong or hitting wrong on the shoe? “Always date your shoes when you buy them,” says Isphording. Don’t keep them longer than six months or 500 miles. “Even if they still look pretty, throw them away,” she says. There is a high risk of injury when running with worn out shoes. Preheat oven to 180°C. Roast chicken thighs for 20 minutes or until cooked through. When cooked, remove from oven (leave oven on) and slice thinly. Set aside. Meanwhile, beat eggs and cream in a small jug. Melt butter in a large, flat frying pan over moderate heat. Pour 1/4 of the egg mixture into the pan, and cook until top starts to set. Flip omelette, and layer ¼ of the feta, tomato and chicken along the centre of the omelette. Fold the outside flaps over the fillings, and press down lightly to set in place. Remove from the pan, and place onto oven tray lined with foil. Repeat steps 3-4 three times to make three more omelets, placing them on the tray beside the first. Top with sprinkled Parmesan, parsley, and chilli powder. Place in oven, and turn up heat to high. When Parmesan has melted,remove from oven. Serve topped with sliced avocado and with a green salad. Trish Caldwell one of our older adults instructors & personal trainers is hanging up her lycra after 15 years in the industry. Trish started her career in Canberra & has worked in many areas of the industry including a registered training organisation & the YMCA before moving to Coffs Harbour. Trish has been teaching our seniors circuit and heartmoves classes, as well as providing the club with some much needed ‘behind the scenes’ administration work. Trish will still be coming in to the club to workout but can now enjoy her well earned retirement which will kick off with a cruise in October. Congratulations Trish on such a wonderful career and enjoy your retirement – you deserve it! Simply take a photo with our logo in it (use signage, car, shirt, bag, drink bottle, stubby cooler, towel, poster etc), post it on your page & tag us along with as many others in the photo as you can. The only stipulation is that it must to be safe, positive & funny but it can be taken in the club, on the equipment, in a class or outside. There are no limits to the amount of photos you can post & no limit to the amount of people you can tag to get maximum likes. The winner will be decided later in the month so get started today. Whoever gets the most likes & comments on their photo will WIN 3 Months Membership! Jacqui is now back into the swing of things in the club juggling classes, personal training & motherhood. She is also introducing Small Group Pilates to Wednesdays at 9.30am from 18th September. These sessions will run for 60 minutes and will comprise a 15 minute Pilates core education section followed by 45 minutes of multi level Pilates exercises. Spaces will be limited to 7 so be quick to book in by calling Jacqui on 0421 971 155. Welcome to your NEW Spring 2013 Timetable! Thank you for all of your feedback over the past few months as those important words have helped us create your best timetable ever. We have come a long way from only offering 6 classes per week when we took over 4 years ago, to now offering over 45 classes per week & we are sure that the new additions & improvements will help you reach all of your goals. The introduction of a Balance class after Pump on Sunday afternoons, more mid morning classes & 30min High Intensity Interval Training (HIIT) classes are just a sample but click here to view the entire new timetable or pick one up on your next visit. Be the first to launch & experience the latest releases from Les Mills for PUMP, CYCLE, ATTACK & BALANCE. 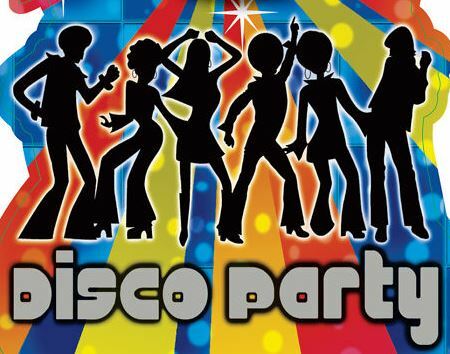 An exciting first ever Friday night Disco Party of exercise is ahead of you with all classes taking place on the one huge night. The club will be open until 8.45pm & child minding will be available from 5.15pm – 8.45pm! Bring a buddy for FREE to all class launches but please book early as places are limited. Call 6658 6222, email info@coffscoasthc.com.au or book at reception on your next visit. You may have noticed Jenny hanging around in the club a little bit more than normal recently, well that is because she is our new Full Time Member Services Manager. Her primary role is to ensure that all of our wonderful members enjoy a fantastic experience every time they come to the club. She will be spending most of her time at reception & on gym floor, so if you have any problems or any ideas just grab her at anytime. 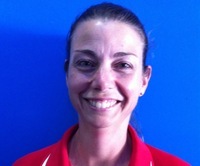 Jenny is also a fully qualified personal trainer as she completed the Australian Institute of Personal Trainers course with us last year & can help you with what ever you need. Congratulations again Jenny & we are very excited to have you as part of our amazing full time team! Grab your diaries because our annual member’s Christmas Party has been set down for Friday 29th November. The venue is yet to be advised but we have managed to secure the talents of the very exciting local musician Kane Cahill. 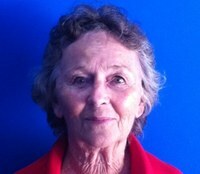 Originally from Melbourne and then Forster, Kane moved to the Coffs Coast 5 years ago. An avid sportsman, Kane only first got involved in music when his new school didn’t offer many sport classes. It was here that Kane’s vocal talents were recognised by a teacher who encouraged him to pursue music further. Kane regularly plays gigs all over the Coffs Coast & further afield. He plays original songs he writes himself as well as covers of all of your favourites. You may have seen Kane recently on Channel 9’s Australia’s Got Talent & is a much sought after local musician. 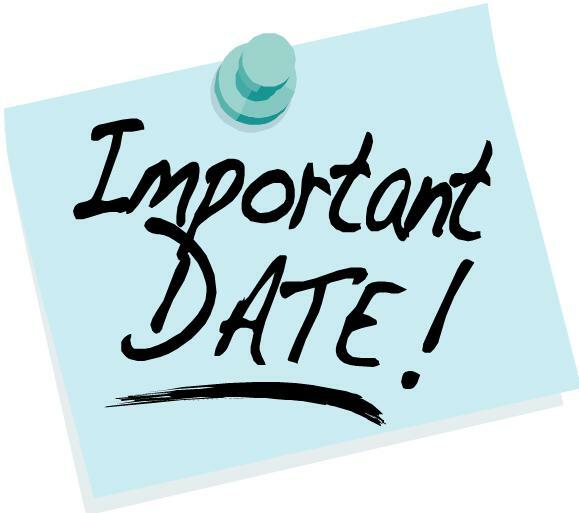 Remember….. Friday 29th November, set it in your diary today so you don’t miss out! Can’t wait! Keep and eye out for the New Small Group & Team Training timetable going up behind the rowers in the gym this week. It will show the times, types, locations & trainers of all sessions. There is a large variety of sessions on offer including Pilates, Kickboxing, Suspension Training, Boxing & TABATA just to name a few. If you prefer to workout in groups of like minded individuals or if you are looking for some more motivation at a more affordable price… then Small Group & Team Training sessions are for you. Choose your goal, check out the timetable, contact the trainer & get started today. Live your dream in 2013! The fitness industry is booming. With an increased focus on health and fitness there is unprecedented growth and demand for high quality personal trainers and fitness professionals. industry, how to get involved, and what it takes to be a success. Listen to Personal Trainers and local Campus Directors, Steve Marquette and Tracy Welsh engage you with how they became immersed in living their passion as personal trainers and business owners and how you can do the same. Do something you’re passionate about, help people achieve their goals & kickstart your career in fitness! If you can’t make it that night, Steve or Tracy are happy to catch up with you individually to discuss the opportunities & help you start living your dream! Just call or email them directly. Fathers’ perceptions of dinner were critical in where dinner is actually held, whereas mothers’ perceptions did not have the same effect. “The more fathers feel that dinner is important, the less likely they will eat at a fast food restaurant,” McIntosh, a Texas A&M AgriLife sociologist, told the Bryan-College Station Eagle. Fathers are more likely than mothers to opt for fast food restaurants when eating out with their children. The researchers suspect that this is due to the fathers wanting to make children happy whereas mothers tend to focus on encouraging sound nutritionally choices. Fathers who excessively eat fast food and who don’t participate in many daily exercises often influence their children’s diet and activity level. Fathers can start learning about nutrition issues, which will help them become more discerning customers as more restaurant chains start making this information readily available. 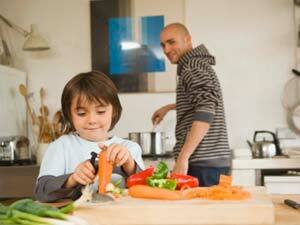 Fathers can start cooking meals with their children, thus having fun and eating in. The father can bond with his children during the preparation (which can be lots of fun – build a pizza, anyone?). And all family members get the benefit of a healthier meal and quality family time. Fathers need to really stop and analyze their own activity level and see how they can involve their children in these activities. Summer is an ideal time to do this, what with the longer days and summer vacations. Fathers really need to embrace the influence they have on their children’s diet and activity levels. By taking these actions, they can help their children celebrate Father’s Day all year long. You are currently browsing the Coffs Coast Health Club blog archives for September, 2013.